My photo may not be Pinterest-worthy but those chocolate chip cookies that you see there are super yummy. I promise. I should have taken pictures while they’re still warm-while the chocolate chips are slightly melted; oh, but we cannot wait to eat them. These cookies are so good, they’re soft and chewy with a hint of coffee and with the added chocolate chips on top, it is a sure hit. The recipe is adapted from Anna Olson of Food Network Canada. I didn’t change a thing except I added a couple teaspoons of coffee powder, because I love the taste of coffee and chocolate together. Combine flour, cornstarch, baking soda and salt and coffee powder (if using) in a bowl, mix well and set aside. Add flour mixture, beat for 1-2 minutes. Stir in chocolate chips. Optional: As soon as you pull cookies out of the oven, add more chocolate chips on top. 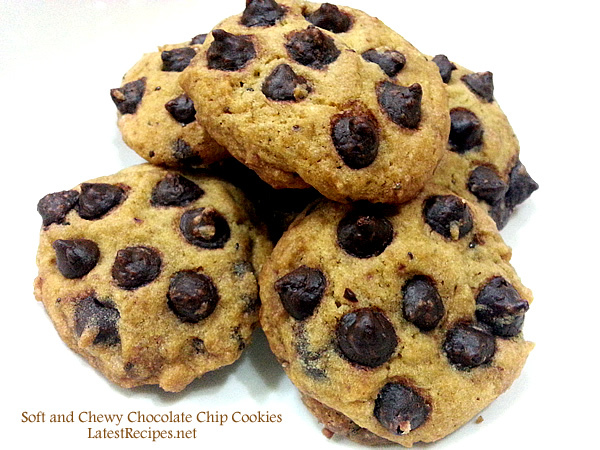 One Response to "Soft and Chewy Chocolate Chip Cookies"
It’s tummy worthy for sure! !